This event will feature work showcasing some of the amazing talents that you can find on the Art for Your Cause online store. 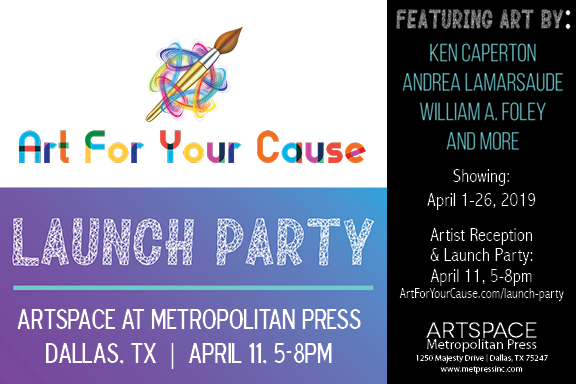 RSVP today at https://ArtForYourCause.com/launch-party and you will be automatically entered into their prize drawing which will take place at the event (must be present to win). Art for Your Cause will donate 10% of the proceeds to your favorite charity. So stop by, check out some art, win cool prizes and support amazing causes! Art For Your Cause (https://artforyourcause.com) is an online gallery with a philanthropic twist. Art For Your Cause brings art lovers, artists and nonprofits together through their unique community. ArtSpace is located inside Metropolitan Press, on Majesty Drive in Dallas. Metropolitan Press (https://metpressinc.com) is a Dallas-based printing and publishing company with a passion for helping non-profit organizations achieve outstanding design and quality for all printed materials. From business cards, annual reports, event invitations and banners, to t-shirts, promotional items, postcards and brochures, we are here to help with your print project, from start to finish!